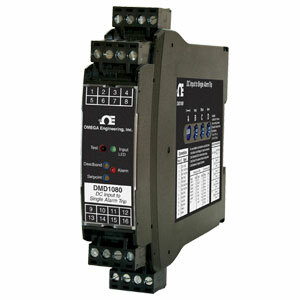 The DMD1080 accepts a DC voltage or current input and provides visual alarm indication and alarm relay contact outputs. 15 voltage and 9 current input ranges can be field configured via external rotary and slide switches. Offset ranges such as 1 to 5 Vdc and 4 to 20 mAdc are also included. Heavy-duty relay contacts allow the module to directly control high capacity loads. Front accessible potentiometers are used to adjust the alarm setpoint from 0 to 100% and the deadband from 1 to 100%. The unit provides a single setpoint adjustment of the two DPST relay contacts. The alarm output can be field configured for HI or LO operation, latching or non-latching, and normal or reverse acting.